In the past, Japanese swords have occasionally had mei or inscriptions on them saying that “Namban Tetsu” was used to make them. Namban Tetsu translates literally as “Southern Barbarian”, so that means that Southern Barbarian steel was used in their manufacture. Exactly how much of this steel was used and how it was used was never described however. Yoshindo believes that no more than 3 or 4% of the steel used in a sword was Namban Tetsu, and there are good reasons to believe this. Namban Tetsu was made by the Spanish in the Philippines, and then exported to Japan, starting in the Muromachi period. From mei or inscriptions on Edo period swords, Namban Tetsu was still being imported in the Edo period and was still being used sometimes in the manufacture of swords then too. 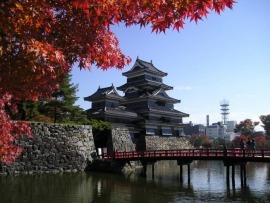 However, at the time this steel reached Japan (in the 16th and 17th centuries), Japanese steel was a far superior product. Japanese steel was very pure and contained a carbon content of 1.5 % or more which was necessary to produce a good sword with a hamon. 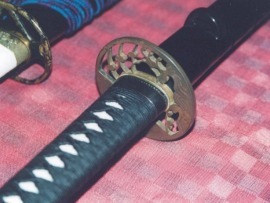 A traditional Japanese sword typically has steel with about .6 to .7% carbon. Forging the original tama hagane with a carbon content of 1.5 to 2.0% results in a sword with a final carbon content of about .6 to .7%. This high carbon content is necessary to produce a strong tough steel, and is also necessary to produce a hamon. Since Namban Tetsu was a European style steel, it probably had a carbon content of about .2% or less. That means that it could not be used by itself to produce a proper Japanese sword. After forging the .2% carbon steel and shaping it with Japanese techniques, there would be almost no carbon left in the final steel. It would be impossible to make a good quality hamon without a final carbon content of about .5% or higher. In view of these facts, one has to wonder exactly how this steel was used in Japanese swords, and there are several ways it could have been done and still result in a good sword. The most obvious way to use the Namban Tetsu would have been to break it up into small pieces and run it through a small tatara to add carbon to it and produce tama hagane out of it. This type of re-refined steel is called “oroshigane”. Oroshigane is steel made from salvaged steel and iron or any other steel which is not completely suitable for use in a sword. By processing the steel in a small tatara or furnace, the final product would be a fairly uniform high carbon steel which would be suitable for making a sword. The steel obtained from processing salvage or scrap steel into something that is basically tama hagane is called oroshigane, and this type of steel is still used by sword smiths today (by definition, tama hagane is steel obtained from processing iron ore or “satetsu” into tama hagane in a tatara). Oroshigane is often made today when sword smiths want to experiment with different types of steel for their swords. The problem with this approach is the cost. If a kilogram of steel is required for the final sword, the smith must start with about 4 times that much or about 4 kilograms. To get 4 kilograms of steel out of a tatara, he would have to start with something like 6 to 8 kilograms of the starting material or Namban Tetsu. This would have been an impractical approach as the Namban Tetsu was expensive. In addition, by the time Namban Tetsu began to reach Japan, most tama hagane came from groups who specialized in making high quality tama hagane, and probably few smiths were making their own tama hagane by that time. Another approach to using the Namban Tetsu would be to mix it with the tama hagane and forge them together into the final steel and sword. However, the smith would have to be careful. Too much Namban Tetsu mixed with the tama hagane would dilute the carbon content of the tama hagane and the final sword. Adding a small percentage of Namban Tetsu to the tama hagane used in the sword would leave a sufficient carbon content to make a strong sword and still make a proper hamon. Yoshindo believes that this was the approach used in the past. The swords signed saying they have Namban Tetsu in them look almost exactly like tama hagane swords and one can’t see any differences from traditional Japanese swords. They also have strong hamon. It seems likely that about 3 to 4% of Namban Tetsu was added to the tama hagane at the beginning of the forging process and the two steels were folded together and worked together in a single billet. In addition, many of the swords using Namban Tetsu were made by very highly regarded smiths who would have been very careful about the quality of their swords. From these considerations, it seems very likely that this second approach was used, and a small percentage of the Namban Tetsu was added to tama hagane at the beginning of the forging process. The fact that the mei say that Namban Tetsu was used was because that was an advertisement for the sword or a public relations effort. Thus, in Yoshindo’s opinion, the use of Namban Tetsu was not functional or an improvement, but was an advertisement for the sword smith. Another type of steel sometimes used in Japanese swords is obtained from meteorites. Sometimes some material from meteorites was mixed into tama hagane and the material was forged together into the steel used for a sword. Most meteorites are iron and nickel and other metals. Forging this material into a sword does produce interesting jihada however. Much of this effect is because the nickel in the meteorite material is much brighter than the steel in the jigane. Effects can look something like long chikei across the blade or like strong imotsuru stretching over large portions of the ji. Again, probably only a small amount of meteorite material would have been used (likely about 3 to 4%) so that the carbon level would not be diluted too much and so that the blade would not become too soft. These types of swords are likely to be seen from the shinshinto period towards the end of the Edo period. The main effect of meteorite metal in a sword is decorative rather than structural or functional.